When planning your wedding, meeting or special event, consider one of the most picturesque locations in the country. The North Carolina Arboretum features indoor and outdoor facilities suitable for various sizes and styles. From hosting your wedding to organizing a corporate retreat, the Arboretum staff will guide you through the planning process and make your event feel effortless! Make your special day more meaningful by choosing one of the most beautiful natural settings in the country as your wedding site. 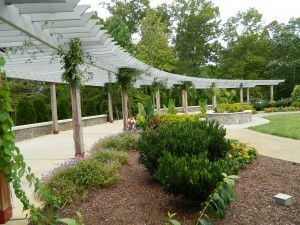 The Arboretum’s Green Wedding Program offers elegantly designed and lush cultivated gardens as venues for ceremonies, cocktail hours and receptions. Couples will follow green initiative guidelines for their wedding and pledge to practice environmentally conscious planning, food/beverage service and décor in order to minimize the environmental impact accumulated during the special event. Please click on the following documents for further information regarding the Arboretum’s Green Wedding Program. Thank you Heartistree Studios for sharing Mallory and Alain’s special day at the Arboretum! For more information about the Arboretum’s Green Wedding Program, please fill out the wedding contact information form. For photos, please view the Arboretum’s Wedding Gallery. Host your wedding before June 30, 2019, and receive HALF-OFF Arboretum wedding coordination services. The North Carolina Arboretum hosts a wide range of events. Most of these will fall into one of two categories: Meeting or Facility Rental. Meetings are low-impact events that happen during office hours (M-F 9 a.m. -5 p.m.) and require minimal set-up and staff time. A meeting typically does not involve outside vendors beyond a catered lunch. Facility Rentals are event rentals taking place outside office hours and/or any events that require additional coordination and management by Arboretum staff. Events with one or more of the following elements would be considered a Facility Rental: complex setup needs, unique parking requirements, multiple outside vendors, expected attendance above 150 guests, alcohol service, or entertainment/performers. Please note that this list is not comprehensive and other event types/elements may qualify an event as a Facility Rental rather than a Meeting. Facility Rentals can be social or corporate bookings. Meeting Rentals at The North Carolina Arboretum are your answer to a successful staff meeting, workshop, or corporate retreat. Each meeting space overlooks beautiful mountain vistas and serve as the perfect setting for achieving your company or organizational goals. Please click on the following documents for further information regarding the Arboretum’s Meeting Rentals Program. For more information on the Arboretum’s Meeting Rental Program, please fill out the event inquiry form. Looking for a space to host an evening reception, corporate dinner or other special event? 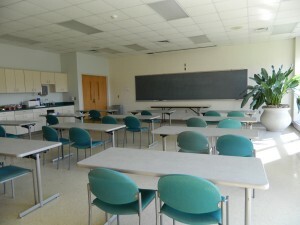 The North Carolina Arboretum offers indoor and outdoor facilities for various styles of private, corporate or organizational events. Please click on the following documents for further information regarding the Arboretum’s Facility Rentals Program. For more information on the Arboretum’s Facility Rental Program, please fill out the event inquiry form. Book Your Wedding, Meeting or Facility Rental Today! Ready to host your event at the Arboretum? Let's get started!